What have I been up to while everyone around me is jetting off on exotic trips abroad or spending a storm at the shops? I am trying to learn a bit of French with the aid of husband's old grammar book. Not as a hobby, more like a necessity. Next year if I have more time I'll attend some classes at Alliance Francaise. This book, it is mottled with its 25+ age and needs constant patching up with sellophane, I am so glad that I did not make him throw this away when we moved house three years ago. Similarly, my facility with languages is much deteriorated with age too, it is so difficult to wrap my head around all the masculines, feminines, articles and oh the verbs, *#@&%*, just strangle me already. Well, anyway, the thing in the ramekin is supposed to be Jacques Pepin's no-flour, no-egg, no-bake, super-duper-easy Chocolate and Chestnut Cake. Melted chocolate, butter, rum, chestnut puree stirred together and chilled. Truth to tell, it resembled nothing like cake. I would describe it more like a chocolate flavoured chestnut paste. It was not inedible, but if it was served to me in a restaurant, I would definitely be rather unhappy with it. But OK lah, good compared to French grammar. There is still another can of (v. yummy btw) chestnut puree in the pantry, so we will have another go at the recipe in the near future. On hindsight, we really did muddle it up quite badly. For one thing, we should really have determined how much really is 6 oz of butter. The book unhelpfully said it is equal to 6 tablespoons, or 1/2 stick. Wei, wei, we are now in metric age and I've never seen butter packaged in sticks in this city. Something also tells me that we probably shouldn't have melted the butter and spooned in 6 tablespoon of the liquid as substitute. Actually, I don't think the butter contributed anything at all, seriously contemplating substituting with cream instead. And the chocolate, Hershey, it tasted quite vile and pretty much overwhelmed the chestnut. We definitely need to use better tasting chocolate next time. Husband said he did not know there are different types of rums. The recipe said dark, we used the only bottle at home which looked decidedly pale. The Weekend Dog Blog post is in my other blog. Else you can click here. Why do some people eat sandwiches with fork and knife? Eh, it is not a piece of steak you know. Ditto for pizza. Naan bread. And hamburgers. Yes, I can see that the pepper grinder is very tall. How about tasting the food first before showering it with the black stuff. If one is sincere about sharing the tiramisu one should not hold the plate close to the chest while asking in an un-naturally loud and high-pitched voice if friend would like some. Placing the plate in front of and urging the other party to take a bite would be more like it. Why can't people take pictures without using flash? What is the logic behind sharing a salad? It's 20 minutes already, why was he still yakking on his mobile? Asking for the host to punch him is it? Some things that peeve me when I eat out. Dropped by at Carrie's TEA cafe yesterday and was treated to their version of tea eggs. Was expecting the conventional boiled egg with cracked shells steeped in tea and herb mixture, much like the ones I made months ago. Carrie's version is far more sophisticated and one should discard all conventional expectations when trying hers. First, the whole egg is coloured a rich deep brown. The egg white is not hard as in hard-boiled, but more of the quivery softness of coddled eggs. The spoon dug inside to reveal that the dark orange-y yolk was set just so until it was not runny anymore but still retaining its melt-in-the-mouth feel. The whole egg, right down to the centre of the yolk, was imbued with the intriguing multi-layered tea soup that it was cooked in- the flavours of sweet and savoury mingling with woody herbal accents. It was over all too soon and the only thing we could do was sing praises and express our wonder. At only $3 per egg, I reckon this is also a highly affordable indulgence too. 25 pieces are made each day, additional pieces needs to be ordered 3 days ahead. Carrie revealed that it took them a lot of trial and error before they could get it right. In case anyone is interested in duplicating it, she let on that the process involves exactly 36 steps, some of them quite precarious and very exact. Alternatively, one could enjoy it at her beautiful cafe with some premium Chinese tea and read from her collection of Penguin paperbacks. Ivan has posted about the November makan outing at Farmhouse Family Restaurant. Click here. I was at two wet markets this morning and was struck by how few customers there were considering it was a weekend morning. Most of the customers were in the 'older' age groups. The only faces below 25 were stallholders or domestic helpers and well, maybe two or three bored children. The butcher was bemoaning that business is so bad two of his neighbours have taken up the government's offer to buy back their stalls for $18000 each. Where do these people go on to do after they give up their small business? If everybody sells up, that means we will have fewer choices in terms of where we get our food supplies. Busy lifestyles mean we have no time to go to the market, I for one, work Mondays to Saturdays and am loathe to wake up early on Sundays just to go to the market. It is easier to settle for whatever the supermarkets are selling, even though our mothers and aunts tell us the stuff at the wet markets are better, fresher and sometimes cheaper. After a while, we forget how good food should taste like. I count myself lucky than most because husband, who doesn't work Saturdays, goes to the wet markets to buy the stuff I need. Even so, he only needs to go about once a fortnight as he buys enough to stock our capacious freezer at each visit. The stallholders love him, because he buys plenty and doesn't bargain. Instead of getting better discount, he gets better value. The fishmongers may let him have some of the garoupa that he sets aside for the restaurant chef. The butcher who sells only chilled pork (as opposed to the more common frozen stuff) would pull out a better cut from his chiller and give him priority over his other more picky, more haggle-y customers. There are other ways to support your wet markets. We buy fish from Whampoa and Tekka Market, mutton from Tekka and fresh pork from Whampoa. What about chicken? Thanks to my friend F, we heard of James, who sells them in Tiong Bahru. The thing is, James does delivery too. Whole kampung chickens and regular (i.e. battery) chicken parts like breasts, backs, wings and livers form my usual order, the livers are usually thrown in free because he knows we have dogs. James would also offer to buy vegetables if you need any. Other stallholders may do deliveries, it doesn't hurt to ask. I know the guys at the Chia vegetable stall in Tekka would deliver if you request nicely. Speaking of fruit and vegetables, most of mine comes from Pasir Panjang Wholesale Market. Courtesy of wholesaler FreshDirect. FreshDirect started in the dot-com days as an online supplier to retail customers like office workers and other busy people. Around the same time, we bought a citrus press and decided it would be nice to drink fresh orange juice every day. With FreshDirect, I could, and still do, order 60-80 pieces of valencia oranges at one go and not worry about carting it home. When SARs came, their business took a big hit and they turned to supplying restaurants. Today, so they told me, I am their only retail customer. I think they appreciated that I did not stop ordering from them during the SARs period. Most items are sold only in bulk, which means I can't order some of their more perishable items like fresh figs, but for the usual staples like green local vegetables, heavy root vegetables and even eggs, they fulfil my needs most adequately. Does all this means we don't ever shop at supermarkets? Of course not, don't you know Cold Storage delivers? Like many Malaysians, the week of Deepa-Raya was spent with family. When families gather, good food is not far behind. We celebrated Deepavali with a dim-sum lunch at Chef Choi's Restaurant (Jalan Ampang, next to the temple). The chef used to work at the Chinese restaurant at Ritz Carlton. The food was generally good but not outstanding. Opinion around the table was that the standard of the cooking has slipped somewhat since its opening. The day after Deepavali was spent at The Curve and Ikano, i.e. indoors, because the rains came. Husband decided on Ah Tuan Ee's which was supposed to serve the best Nonya food in town. I would disagree, the dishes were neither the best nor the worst, just good enough to keep the majority happy. Servings were small and rempahs rather homogenous making some dishes taste too one-dimensional and forgettable. On the evening before Hari Raya, my aunt and uncle invited some of us to their home for dinner. My aunt and her husband spent many years in France and have a deep affection for everything French. The table was set with French linens, heavy silverware and beautiful dinnerware. The menu was homely and kept simple. French hams salad to start. Then brown rice with a Greek-style lamb stew. Optional cheese course followed by fruit salad made with local fruits, orange juice, liqeurs and sugar. Hari Raya day. Like the rest of the holiday so far, we woke up with no plans at all. Daddy and husband decided to forage for food in Bangsar. The market was empty save for a flower stall and the chee-cheong-fun man. To supplement the chee-cheong fun we went further afield to the coffeeshop behind the market where there was very yummy pan-meen and S'ban siew baos to round up the brunch spread. Back home we found more food, fifth brother was in the mood for baguettes, bacon and sausages which he managed to gather at Bangsar Shopping Centre. Dinner that night was at Green View Restaurant in PJ. The famous sang-har-meen was very good, it featured large juicy prawns sitting on a bed of crispy noodles soaked through with rich prawn gravy. There was Marmite crabs and crabs fried with salted egg yolk too, but the crabs were disappointingly small. Much better was their sweet and sour pork and some stir-fried haricot beans. So there I was, wondering what I was going to do with all that spicy mentaiko that I bought at the Kyushu Food Fair a few weeks ago. As luck would have it, this week on AFC one of the programs features this briny delicacy. Since we have plenty of stock on account of it being a stock-making day, the TV recipe was put together with very little effort. The end result was marvelous, the risotto provided a simple foil for the sharply salty, spicy and full-bodied taste of the spicy cod roe. Italian meets Japanese in happy union. All that was needed was a few snips of toasted seaweed and some chopped scallions. Every mouthful to be savoured slowly and indulgently, the perfect Sunday brunch treat. 2-3 sacs of spicy mentaiko- cut through the sac to extract the roe within. Toast the sac until brown, then cool and crumble. Mix the roe with some butter or olive oil. 1. Heat some oil and butter in a pan. Cook shallots and scallions until soft. (TV recipe used olive oil, but mine had gone off so I substituted butter. Onions were also suggested, but I wanted to use up the white parts of my scallion and so did not need a big onion). 2. Add the carnaroli rice and stir. Add some white wine and cook till the vapours disappear. 3. Add a ladleful of hot stock and stir until the stock is absorbed. Add another ladleful, and do the same, repeating until the rice is almost cooked through. I like mine to be 95% cooked. If there is parmesan on hand, it is a good time to add the cheese to the remaining stock. 4. Plate the cooked risotto. 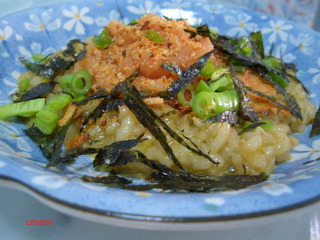 Top with mentaiko and its grilled sac bits, as well as snipped nori and green parts of scallions. Enjoy. Attended a wine dinner at Forture Seafood Restaurant two weeks ago. Organised by the Safra Wine Club. The food was good, but the wines were better. Went back last weekend to eat their crabs stir-fried with salted egg yolks. The main cook was wandering around talking to his favourite customers. Did the fact that he was not in the kitchen have anything to do with our crab being less tasty than it was at the showcase dinner? Mood wasn't much improved when the waiter, to my question on why the flesh of the crab clung so stubbornly to the shell, replied that this phenomenon only occurs when the crab is cooked just right. Seems that I have been eating wrongly cooked crab all my life..... I am not going back there again that's for sure.